This is a Chinese name; the family name is Chan. Eason Chan Yik-shun (Chinese: 陳奕迅) is a Hong Kong singer and actor. Eason Chan has been praised by Time magazine as a front runner in the next generation of Cantopop. He was third Hong Kong singer to be called the "god of songs" after Samuel Hui and Jacky Cheung. In 2012, Time Out Hong Kong crowned Chan as the "King of Asian Pop". 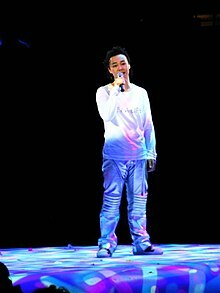 Wikimedia Commons has media related to Eason Chan. This page was last changed on 22 November 2018, at 11:50.